When building a studio you can of course spend as much money as you want. I could have designed a $100,000 audio-only podcasting setup but that isn’t the point here. This is a professional setup at a price that is approachable by really anyone that is serious about podcasting. Yeah it’s a few thousand dollars but these days with Kickstarter and other crowd-funding options, getting the funds would be cake for someone with the drive. When you start looking at professional equipment you start to see prices for mixers that exceed the cost of your first car. The mixer Leo Laporte used in the TWiT cottage cost $22,000. We aren’t going to that extreme for this professional podcast studio. We’ll keep things down to earth but still pretty awesome. Our mixer costs $500, sounds like a steal after that Axia Element console and PowerStation mentioned earlier huh? It’s the Mackie ProFX16 Compact 4-Bus Mixer with USB & Effects. My studio at work uses a Mackie Onyx 1640i 16-channel 4-bus Premium 16×16 FireWire Mixer and it’s a total dream. But it is also $1,600. The ProFX16 is the compact, USB version of this mixer. And while it doesn’t have all the awesome wiz-bang and high-end features of the Onyx1640i, it more than does the job. You have 16 input channels, four of which have compressors, a USB interface for bringing in audio to your computer digitally. A 32-bit processor brings along 16 audio effects, mostly useful for music production, and a 7-band equalizer that takes care of any on-the-spot equalization needs. Most important for podcasting is the quality of the components here and the number of XLR inputs. Mackie is famously durable. This model is no different with its ABS side panels encasing the solid steel chassis. If for some reason you found yourself doing lots of live-gig work with this mixer you can be sure it will stand up to the test of time. Technically you could use just about any digital audio recorder but since we’re going pro on this setup we should skip the consumer and pro-sumer stuff and go straight to the good stuff. Sticking with Zoom, dear lord I love them, is the Zoom H6 Six-Track Portable Recorder. I love just about everything Zoom makes. This is the H4n but now with four XLR inputs instead of just two. If you did an on-location recording, you could do four people each on their own microphone and monitor out to headphones live without latency issues. Each channel has its own gain knob to adjust input volume on the fly, for those times you aren’t using a mixer. Previously I recommended the Audio-Technica AT-2035 at $150 as a fantastic condenser microphone. I also mentioned one of the problems of condenser microphones is their sensitivity. Fabulous for quiet rooms but pretty awful if you can’t control the room noise. Sometimes it’s worth the risk due to the awesome audio condensers can create. But what if there was a dynamic microphone that sounded like a condenser without the room noise? Enter the Heil PR40 Microphone. This has to rate as one of the best dynamic mics I’ve ever come across, both for tonality and versatility — and it’s probably a good thing for the rest of the industry that Bob Heil hasn’t yet turned his attention to condenser mics! This is the microphone Keith and the Girl use. It’s the microphone Leo Laporte uses. It’s the microphone pretty much everyone who is making real money off of podcasting uses. All the benefits of a condenser microphone and all the benefits of a dynamic all wrapped into one. Seems impossible but it’s true. At $300 it isn’t cheap but it’s worth it. And besides, $300 for an awesome microphone isn’t a bad deal at all. The Blue Microphones Bottle Tube Microphone System with B6 capsule costs $6,000! 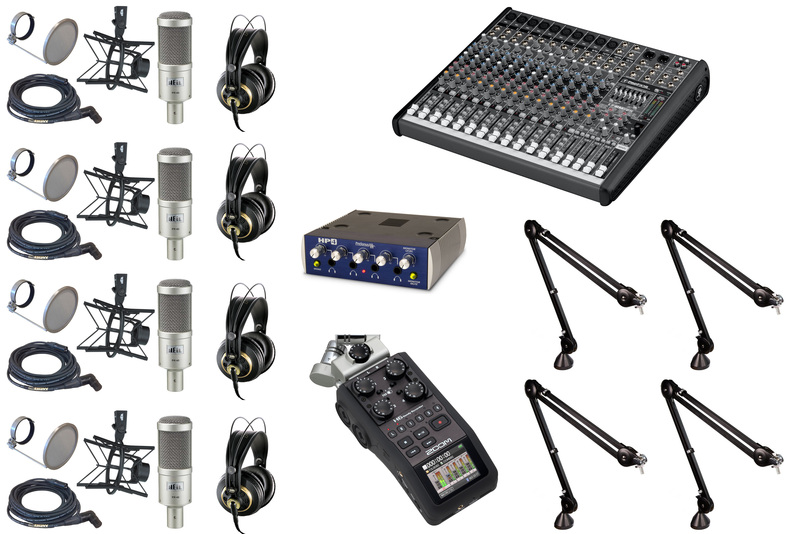 In this case you’re getting the microphone, shockmount, pop-filter, XLR cable and carrying case for under $370. It’s a steal. If you’re spending $370 for each of your microphones, you might as well have a set of headphones to match. The AKG K 240 MKII headphones are fabulous and still affordable. Unlike all the other headphones mentioned here, these headphones are semi-open. Being partially open headphones, these may leak some audio and you’ll be able to hear stuff going on around you, at least a little bit. But this isn’t the worst thing in the world by any means. But the sound leaking out won’t be a problem with the Heil PR40 microphones. It might cause feedback issues with the Audio-Technica AT-2035 condenser mics but not here. So go for it. Plus these sound great outside of the studio. My first foray into high-end headphones were the original AKG K 240s and I actually prefer the look of the originals. For all intents and purposes, they are exactly the same as the MKII only you can find these for $70 on Amazon. The differences are pretty minimal especially if we’re talking podcasting. With so many headphones you need a headphone amplifier to power them all. This is not like sharing earbuds from your iPhone. These are bigger headphones and being split four times. You could just keep turning up the volume but you will risk damaging the mixer and your headphones. Plus you cannot fine tune the audio for someone who might have hearing problems and needs a boost in power to their headphones. With these slightly more power-hungry headphones, and considering this is a professional setup, it’s time to step up from a $25 Behringer headphone amplifier and go for the PreSonus HP4 4-Channel Compact Headphone Amplifier. You’ll still be limited to four people with headphones from this unit, unless you start dropping a few more bills, but the quality of the power from this amp vs the Behringer is definitely noticeable. Oh but say you have four people now and this is great but you have six people later on. The PreSonus allows you to daisy-chain another PreSonus, indefinitely, adding 4 more headphones each time. Pretty nifty! Everything is better on this guy. From the fit and finish to the internals, the Behringer has nothing on the PreSonux except the $100 discount in price. With the Heil PR40 microphone + shock mount weight, those cheap scissor-arm microphone stands I suggested earlier won’t cut it. Your mic will drift downward the entire show. Not ideal. Luckily Heil and RODE both make awesome, albeit expensive, scissor-arm microphone stands. I’ve chosen the RODE PSA1 Swivel Mount Studio Microphone Boom Arm for this system. It’s basically the Heil but $25 cheaper. You can tell just by looking at these that they are built much better than the previously recommended stands. All the springs are internal which not only makes them nicer to look at but also helps reduce noise as you adjust them. If $100 for a mic stand is too rich for your blood, pickup the ProLine MS112 Desk Boom Mic Stand. This stand won’t be as flexible in placing your microphone as the scissor-arm stand but’s $70 cheaper! It features die-cast metal clutches and a heavy-duty die-cast base with a 1″-9″ telescoping boom and 12″-17″ adjustable height. Note, use this link to get the Heil package. It’s a better deal not available from Amazon. Not convinced that this will cover you? Then you’re out of my league. This entry was posted in Life, Nerdiness, Thoughts and tagged best podcasting microphone, best podcasting mixer, Digital audio, heil pr40 review, kickstarter, Leo Laporte, Mackie, Podcast, podcasting, professional podcast equipment, Recording studio, Universal Serial Bus, XLR connector by Justin Scott. Bookmark the permalink.